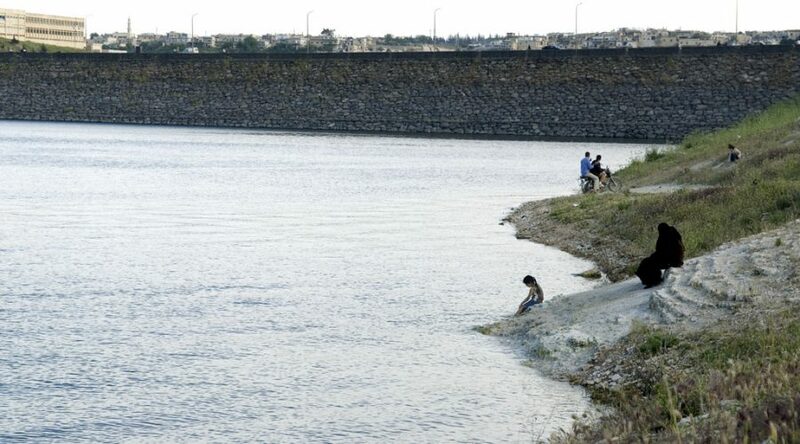 In response to the low level and high variability of rainfall and a dependency on internationally shared water resources, Syria has, like most MENA countries, invested heavily in technology and infrastructure to store and divert water resources and to deliver water services to farmers, industries and households. In recent decades, Syria has experienced a period of ‘water storage development’, resulting in a total storage capacity of 19BCM in 166 reservoirs (Table 1), equivalent to 120% of the actual annual renewable water resources of around 16BCM. Three large dams in the Euphrates basin were completed in the 1980s, which together account for almost 16BCM of potential storage volume. The actual storage volume depends of course on climatic variability over the years and management of the reservoirs. Table 1. The main dams and their storage capacity per basin. Before the war, drinking water reached 99% of the population in urban areas and 90% in rural areas, with a total national coverage of 93%. However, a close look at the indicators by region shows wide disparities in performance between Damascus and other governorates in the north-east of the country. In addition, the supply is intermittent and, in some regions, stopped completely for more than nine days. Non-revenue water – water that has been produced by treatment plants but is lost before it reaches the customer – is high at 33%, and large disparities in daily per capita consumption are evident between cities and rural areas,standing at 125 litres in the former and below the target of 80 litres in the latter. Norias are water wheels made of wood and nails with boxes hung on the nails. They are constructed on rivers to bring water to agricultural land, homes, mosques, cafés and bars. The wheels rotate with the water flow in the river. The mouths of the boxes face the water flow when they approach the surface of the river and leave it filled with water. This water is then poured into a multi-stream canal to be distributed to different users. 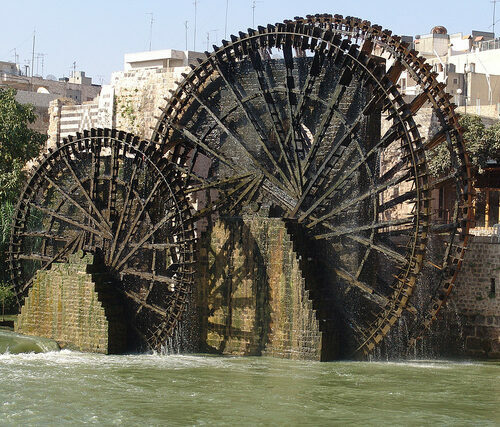 The city of Hama has 17 norias on the Orontes River, but only four of them are still operational. The biggest noria in Hama has a 20-metre diameter. It rotates once every 20 seconds, raising 2,400 litres of water from the river in each rotation. Norias once played an essential role in agriculture. Although their role in irrigation has gradually declined, both as a result of the falling water level in the river and the introduction of modern irrigation systems, their touristic value has increased. Hama’s norias, which were built by the Arameans in 745–727 BC , are claimed by the local population to be the oldest in the world. Syrian artefacts often depict norias, such as the magnificent mosaic plate found on Column Street in the ancient city of Apamea, 55km north of Hama, which dates back to 420 AD. A qanat is a traditional system used across the region for the transportation of drinking and irrigation water. The system consists of an underground tunnel and a number of shafts to bring water from the highlands to the lowlands using gravity. A recent study identified a total of 42 qanat sites in Syria, containing 91 qanats, of which 30 are still functioning. It is not clear when these qanats were built, but there are some indications that they have been in use since Roman times. Before the war, Syria had an ambitious plan to build 345 wastewater plants at a total cost of around $165 million). Overall investments in wastewater treatment and effective environmental management systems are poorly managed and fall short of the urgent need. In 2009, water-related institutions began planning for a comprehensive national water strategy. With support from GIZ, a German development agency, all water-related stakeholders participated in a water baseline study. The study aimed to assess the current situation and support decision makers in devising long-term objectives. Because of the war, there was no follow-up and the strategy was never completed. The National Agenda for the Future of Syria (NAFS) was initiated under the United Nations Economic and Social Commission for Western Asia (ESCWA) to chart a future vision for Syria as well as programmes for rebuilding after the war. The water group consists of Syrian water experts from all backgrounds who recommend strategic directions to address the country’s water challenges. Ministry of Housing and Construction. 2011. “National Performance Indicator Drinking Water and Sanitation Report”.